Woodworking is a hobby which should be restful and enjoyable, and there is more to it than just a way to objects to sell for money. 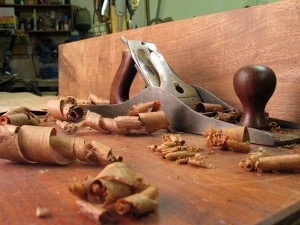 If you love to take time working with wood and making new object then you will like working in your new hobby. This is a good place to starting your research into woodworking. Look before you leap. In the past woodworking was a learn by doing activity, well it still true, but the resource will help into the time it takes to learn, while lessening the natural confusion in such a complex hobby. Woodworkers come in a wide spectrum of types, from the completely organized to the completely scattered. Organizing your shop so that you can find all your tools when you need them, and have room to work, will enhancing your personal style and enjoyment. It used to be that you had to either know a knowledgeable woodworker, or be lucky enough to have a woodwork program at a local school to be able to learn about woodworking. Not any more. Although school are cutting back on programs like woodworking, it know possible to get valuable training over the internet thought distance learning programs. Woodworking is an ongoing learning experience, taking years to gain knowledge and progress in skills need. Our ability to improve woodworking skill and develop new uses for wood grows over time. There are many areas of woodworking to examine, luckily the skills needed in one specialty often overlap with the skills used in other areas. Many people can become skilled at making things from wood, learning different techniques, each with a specific job to be completed. Gaining knowledge of wood types, and what each type of wood makes the best type of object. While learning about different aspects of woodworking and your own personal preferences, it is often difficult to know which tools to acquire. Getting started can be daunting, but does not have to mean a shop full of expensive equipment. Learn which tool to use and how to utilize and care for your tools. Develop skills in the use of hand and power tools using them safely and effectively. By understanding the basic concepts and techniques, you will learn the skills needed for woodworking projects.